Deacon Augustine Gesnel on the day of ordination. 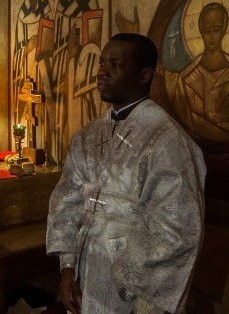 Paris - Wonderful news for those whose hearts are touched by our brothers’ plight in Haiti: on Wednesday, February 12, in the Cathedral Church of the Diocese of Korsun in Paris, Bishop Nestor of Korsun ordained into the deaconate a Haitian seminarian Augustine Gesnel, who is studying at the Russian Orthodox seminary in France. Until he graduates, the newly-ordained deacon will serve as a deacon as part of the seminary clergy, and after returning to Haiti, he will serve at his home parish of St Augustin in Jacmel. There are 3 more ROCOR Haitian seminarians studying in Paris. Although the seminary pays for the Haitian seminarians’ studies, they wouldn’t have been able to attend seminary, had it not been for the help of the Fund for Assistance’s HOFR (Haiti Orthodox Family Relief) program. Had it not been for the help of donors like you, Deacon Augustine wouldn’t have been able to study in France, and the mission wouldn’t have had a chance to add to its scant numbers of clergy. If you would like to see the mission grow, please consider supporting our efforts in Haiti!